Daniel Bourgue, "who must surely be the last representative of the old school of French playing," has been acclaimed as one of the finest soloists of his generation, praised for his virtuosity, his tone quality, and the elegance and purity of his style. In addition, he is a renowned teacher and his publications are major contributions to the horn literature. Bourgue was born in 1937 in Avignon, France and began his musical education there, studying cello, horn, harmony, music history, and chamber music. After receiving a Premier Prix at the Avignon Conservatory while still in secondary school, he entered the Paris Conservatory, where after eight months he obtained a Premier Prix in horn in the class of Jean Devemy. At this time he began his career as soloist and chamber musician, which has taken him throughout the world. Bourgue has performed with the Orchestre National de France, the Concerts Pasdeloup, the Nouvel Orchestre Philharmonique, the Ensemble Orchestral de Paris, the London Symphony Orchestra, the National Orchestra of Mexico, the orchestras of Munich, Sofia, and Cologne, and the Salzburg String Quartet. From 1964 until 1989, he served as principal horn of the Orchestre du Théâtre National de l'Opéra de Paris. Numerous composers, such as M. Bleuse, G. Barboteu, G. Delcrue, M. Constant, A. Tisne, and E. Cosma, have dedicated works to Bourgue, and he has given premier performances of numerous contemporary compositions by Messiaen, Delerue, Pousseur, Jolas, Ballif, Constant, and Francaix. Bourgue's publications include five volumes of the method Techni-Cor, a book Parlons du cor (translated into several languages), a transcription of the Bach cello suites, and numerous editions and arrangements of horn literature. He is a director of the publisher Edition Billaudot. In later years Bourgue has been devoting himself to solo performances and teaching. He has been on the faculty of the Versailles Conservatory until recently (now retired) and frequently participates in conferences and leads master classes. Since 1987, he has directed programs for the National Youth Orchestra of Spain. His discography has been awarded Grand Prix du Disque. Bourgue is President of the Association Nationale des Cornistes Français. 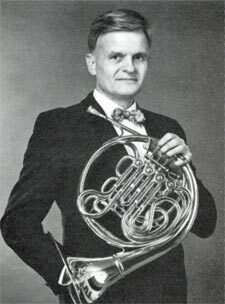 He has served two terms on the IHS Advisory Council (1980-86), was host of the 1982 International Horn Symposium in Avignon, France, and was elected an IHS Honorary Member in 2008.